You’ve seen it a hundred times: A player rounds third, heading for home; a strong throw from the outfield beats him to the plate; and the runner finds himself confronted with a catcher blocking his path, leaving him with no other choice but to plow over the catcher in hopes of dislodging the ball and subsequently being called safe. But due to a new rule (rule 7.13) instituted by Major League Baseball on Monday, you may never see that again. An agreement to form some kind of rule to prevent home plate collisions was formed back in December at the Winter Meetings, however, it wasn’t until Monday that an official rule was released highlighting what will be allowed and what will not in 2014 (and beyond if the rule is successful). A runner attempting to score may not deviate from his direct pathway to the plate in order to initiate contact with the catcher (or other player covering home plate). 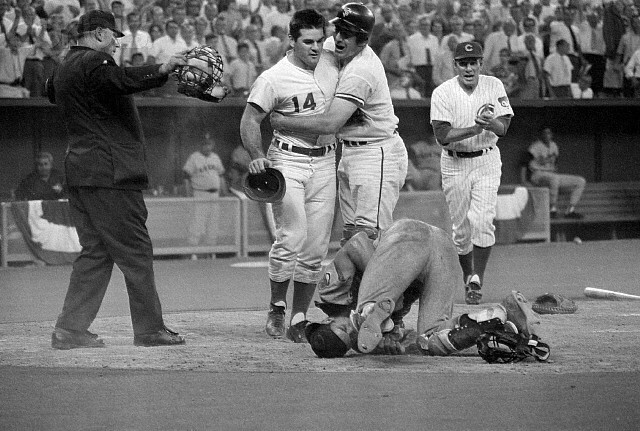 If, in the judgment of the umpire, a runner attempting to score initiates contact with the catcher (or other player covering home plate) in such a manner, the umpire shall declare the runner out (even if the player covering home plate loses possession of the ball). In such circumstances, the umpire shall call the ball dead, and all other base runners shall return to the last base touched at the time of the collision. Rule 7.13 comment: The failure by the runner to make an effort to touch the plate, the runner’s lowering of the shoulder, or the runner’s pushing through with his hands, elbows or arms, would support a determination that the runner deviated from the pathway in order to initiate contact with the catcher in violation of Rule 7.13. If the runner slides into the plate in an appropriate manner, he shall not be adjudged to have violated Rule 7.13. A slide shall be deemed appropriate, in the case of a feet first slide, if the runner’s buttocks and legs should hit the ground before contact with the catcher. In the case of a head first slide, a runner shall be deemed to have slid appropriately if his body should hit the ground before contact with the catcher. Unless the catcher is in possession of the ball, the catcher cannot block the pathway of the runner as he is attempting to score. If, in the judgment of the umpire, the catcher without possession of the ball blocks the pathway of the runner, the umpire shall call or signal the runner safe. Notwithstanding the above, it shall not be considered a violation of this Rule 7.13 if the catcher blocks the pathway of the runner in order to field a throw, and the umpire determines that the catcher could not have fielded the ball without blocking the pathway of the runner and that contact with the runner was unavoidable. While the rule will take some time to get used to, for both the players and the umpires, for the most part, it’s being accepted around the baseball world. 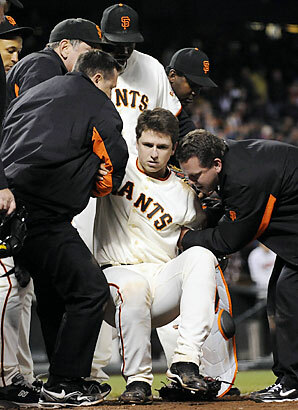 Nearly everyone agrees that the major injury to Buster Posey back in 2011 likely began the discussion for a rule of this nature to be put into place, and Posey’s manager, Bruce Bochy, has been one of the biggest advocators. Not wanting to lose a player of Posey’s magnitude in such a way again, Bochy made the statement in response to the new rule that he’s “all for it”. For me, I’m not fully for or against the rule. Collision plays at the plate can be extremely exciting, especially when it’s the potential game winning run, but I also don’t like seeing anyone get injured on an avoidable play. Although I feel that catchers have done a fantastic job in the last few years of making an attempt to move out of the base runners path and instead use a swipe tag for the out, this new rule will go a long way in ensuring that a rogue player with an altercation to settle doesn’t get away with going out of their way to knock over a catcher. I’m certainly all for that. I was extremely surprised with this year’s MVP voting. Not just with the winners of the award from the American League and National League, but also with the blowout fashion in which they won. I don’t feel it should’ve been such a major difference between first and second place in each league, but it is what it is. In the end, it was Miguel Cabrera taking home the MVP award for the American League, with Buster Posey receiving the MVP award for the National Leauge; as voted on by the Baseball Writers’ Association of America (BBWAA). This was both Miguel Cabrera’s and Buster Posey’s first Most Valuable Player award. I can’t believe how much of a landslide the vote for American League Most Valuable Player was. Although I was pulling for Mike Trout, I pretty much expected Miguel Cabrera to win. But to receive 22 of the 28 first place votes is absolutely ridiculous. Even if you think Cabrera was the more valuable player, you can’t honestly tell me that he was THAT much more valuable than Trout. It’s just not true. So really, I’m not as upset about Miguel Cabrera winning the MVP award as much as I’m upset at how much of a blowout it was. In total, Cabrera beat out Trout by 81 points. Truly incredible for an award that was supposedly going to be close. The main reason Cabrera won the MVP award is the fact that he won the Triple Crown–posting a .330 average with 44 homeruns and 139 RBI’s. While it’s amazing that he was able to accomplish something that hasn’t been done since 1967, I find it necessary to point out that Trout was able to accomplish things no player in the history of baseball has EVER been able to do. Besides, when it comes down to it, just because you posted better stats doesn’t mean you were the more valuable player to your team–which is what the award is all about. So, while the Triple Crown is an amazing accomplishment for Cabrera, it’s not something you should base your vote on, in my opinion. Especially when Trout was able to one up Cabrera as far as historical occurences go. Moving on to the second key aspect of Cabrera’s MVP win, I feel the voters’ pushed Trout out of the picture for the sole reason that he and his Angels didn’t make it to the playoffs, while Cabrera and the Tigers made it all the way to the World Series. I truly don’t understand why you would even consider using that as a reason for picking the most valuable player. If you look at the facts, Cabrera’s Tigers actually had a worse record than the Angels. The reason they made it to the playoffs, while the Angels fell short, is because they played in an easier division. Should Trout be penalized because he played in the difficult AL West, and wasn’t able lead his team to the playoffs? Absolutely not. Making it to the playoffs takes a team effort; Trout could only do so much. He was still extremely valuable to his team, even though it didn’t result in a playoff run. 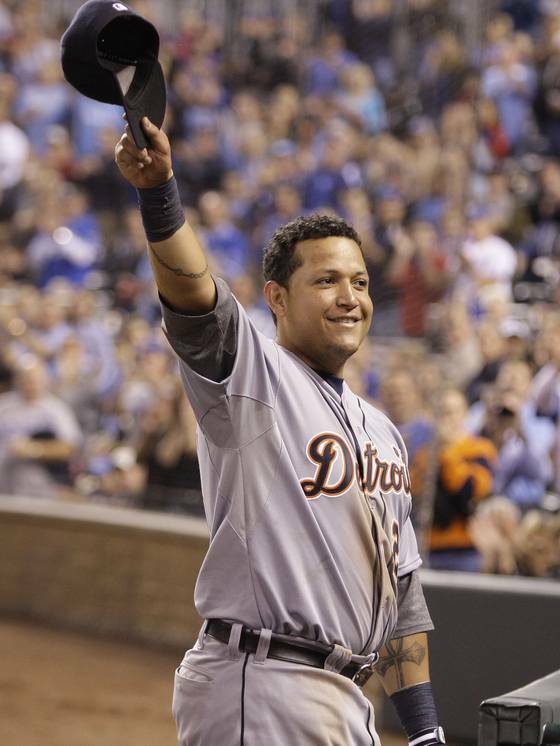 So, while Miguel Cabrera received the award, and will go down in the record books as the 2012 AL MVP, when I look back on this season decades from now I’ll always find myself thinking about what should’ve been. The BBWAA’s vote had Mike Trout finishing second, with Adrian Beltre coming in third. While I don’t feel as strongly about the National League portion of the MVP award as I do about the American League side, I still think Ryan Braun should’ve won the award; but at the same time, I’m not upset that Buster Posey won. What it comes down to for me is what the voters’ (once again) decided to base their decision on. I feel like just as with the AL award, the National League MVP didn’t go to the “most valuable” player, but rather the player that was on the more successful team. So I feel Braun wasn’t given a fair chance in that regard. The only real complaint I have with the National League MVP award is the fact that Posey beat out Braun by an astounding 137 points. I don’t feel the voting results truly show how close it really was statistically between Braun and Posey. Yet another example of how much stock the BBWAA takes in whether or not a player’s team made the playoffs. I’m really getting tired of it. The BBWAA’s vote had Ryan Braun finishing second, with Andrew McCutchen coming in third. My Vote for National League M.V.P. This is the first of four blog posts I plan to publish over the coming days; all of which will focus on who I feel should win the three major awards of Most Valuable Player (MVP), Cy Young and Rookie of the Year (ROY). I’m not all that influenced by stats, and I especially don’t lean towards a player just because their team made it to the playoffs and another player’s team didn’t. I’ve always chosen to look at it by which player had the greatest positive impact on their team, and I’m not about to change things. 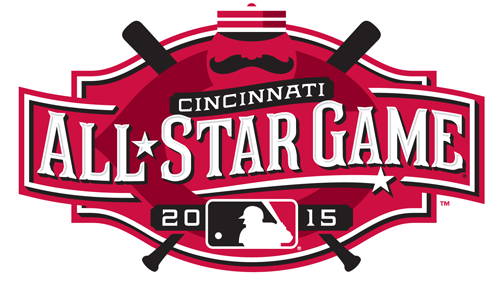 If MVP voting took place during the All-Star break Andrew McCutchen would have my vote, hands down. McCutchen was a big reason the Pirates were 11 games over .500 and atop the NL Central at the time. With McCutchen leading the way, it appeared that the Pirates were well on their way to the teams first .500+ season since 1992–but things didn’t go as planned for McCutchen and the Bucco’s. In the games following the Midsummer Classic, the Pirates did nothing but tumble; with McCutchen sharing in the same fate. Losing a spot in the standings each month following July, the Pirates finished the year 18 games back of first place in their division (good enough for 4th); with McCutchen’s batting average falling from .362 to .327 over that time span. Though McCutchen batted .327 on the year, with 31 home runs and 96 RBI’s, he couldn’t keep up the pace throughout the entire season, which is very key in my book when it comes to making a selection for MVP. When a team relies on a player as much as the Pirates relied on McCutchen, that player has to be able to step up all season long to ensure that the team succeeds. Unfortunately, McCutchen wasn’t able to pull if off. 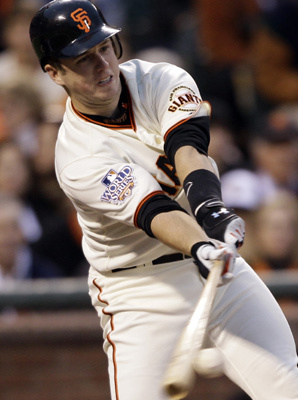 Buster Posey put up incredible stats this season, batting .336 on the year, with 24 home runs and 103 RBI’s, but he didn’t single-handedly put the Giants in the postseason; which is what I’ve been hearing a lot of lately. While Posey certainly played a major role in the Giants’ run to the playoffs, he wasn’t the only one coming up big night, after night, after night. There were several other guys that made major contributions as well. That’s one of the main reasons I feel voting for MVP based on whether or not a player’s team made the playoffs is crazy. Nearly 100 percent of the time, a player didn’t push his team into the playoffs without some help from his teamates along the way. My vote for Most Valuable Player of the National League goes to Ryan Braun. While he didn’t ‘lead his team to the playoffs’, no player in the National League had the impact that Braun had on the Brewers. Without Braun, the Brewers don’t finish out the season as strongly as they did. Which is one of the key reasons he’s my pick for MVP. Braun was ‘that guy’ for the Brewers all season long, and he didn’t let up when September rolled around, even though it appeared the Brewers were out of contention; if anything, Braun got even better. That’s the kind of player Braun is. He impacts his team day in and day out, even when it would be easy to hang it up. Something I’ve been hearing a lot of lately is that Braun won’t win the MVP award due to his 2011 Performance Enhancing Drug (PED) accusation. Even though Braun was found not guilty, some are still holding it against him. My response to that being: Get over it. By putting up even better numbers than last year, Braun has proven to the world that he doesn’t need banned substances to make him a beast; he’s a beast by nature. Though his batting average fell 13 points from last year, Braun smacked 8 more home runs–and for good measure, an extra RBI–than he did in 2011. While I don’t hold too much stock in stats, that really jumps out at me. It’s incredible what Braun was able to do all season long to help out his team. He had the greatest impact of any other player in the NL, and doing so earns him my pick for 2012 National League MVP.